Caterina was so kind to make these items for my Victorian house. 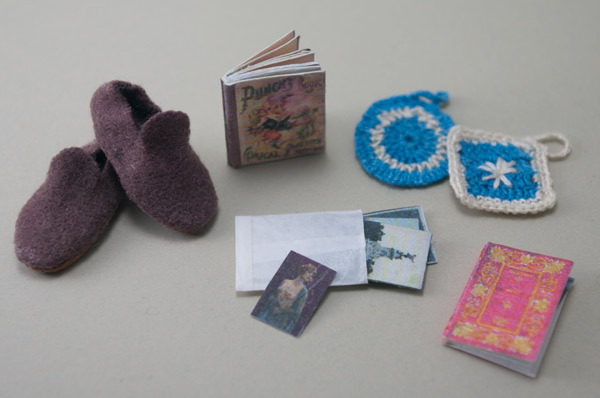 A pair of men's slippers, books with pages, an envelope of tiny postcards and crocheted potholders which will be the perfect colors for the kitchen. I am in awe of her tiny crochet! Thank you, Caterina! With the darker months of the year quickly approaching, I decided that I should no longer rely on my bay window as my photo studio. 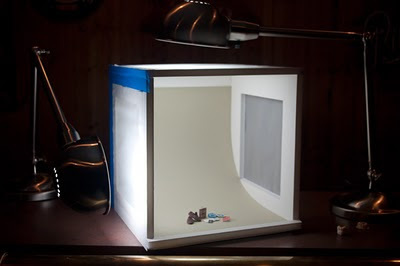 For the cost of some foam core and full spectrum light bulbs, here is my economical solution - a homemade light tent. I can't wait to hear Hubby's reaction when he goes downstairs to the bar in the "man cave" and sees my new studio sitting on top! 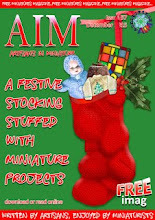 You have received very beautiful minis! Good idea for miniatures photo set! It is a great way to set up a photo shoot. Thank you for sharing it. I like to use my daylight lamp that has a big circular bulb. Your way is probably better for shooting photos of a group of small pieces. "Man Cave" hahah I am still giggling about that. The stuff made by Catherine is always precious! Her men's slippers are fabulous! Enhorabuena por esos preciosos detalles!!! Catherine es una gran artesana y a mi me encantan sus trabajos. OOPS!!! Please forgive me. I have neglected to comment on the beautiful gifts you received from Caterina. Her crochet is lovely, so nicely done! I love the men's slippers and the books too. Congratulations! Lovely gifts from Caterina, she does wonderful work. I love your photo box, you've given me lots of inspiration. Thanks for sharing! Estupendos regalos, el ganchillo tan fino es muy dificil. Me encanta.